This is a drinkable product whose brand is "Gatorade". This is an ad in which we realize that is targeting to all sportsmen. 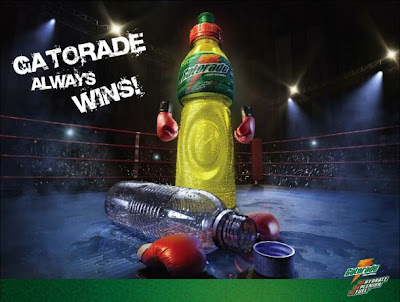 What this ad shows is a water bottle in the boxing ring defeated by a Gatorade bottle so the message is that with a Gatorade bottle someone can get more strenght to overcome himself without losing energy. The image that all of us can see coincides with the slogan "Gatorade always wins". Nice ad! !